The Jerk Pit. No Puns. I ate Jerk chicken at the Jerk Pit. Some restaurants are cool even though (or because) they are a little gruff and chilly. I like those places. I walked into the Jerk Pit for the first time and I instantly loved it. The Godfather at the counter didn’t trouble himself in the least. He was memorably unfazed. I’m also pretty sure he doesn’t remember me. 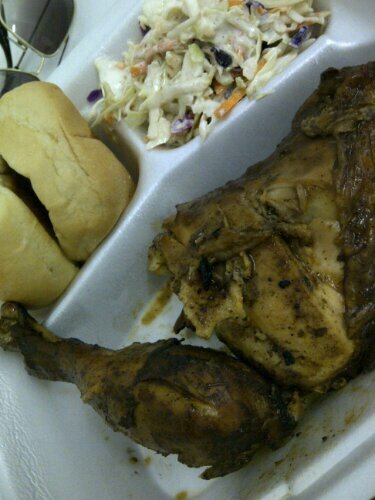 I had a quarter chicken, rolls and coleslaw for lunch. It cost $5.40, it was a lot of food and it was good. The coleslaw was a little mayo heavy so if you’re not into that… Wanna hear about the earthiness of the spice mix on the chicken? Read someone else’s blog. I gave the Jerk Pit 736 out of 889 points.